Video Screenshot is a free video screen capture software, it can play many video formats and save them as image files, the output screenshots can be JPG, BMP, PNG or Animated GIF images. Supported video formats include MP4, AVI, FLV, MKV, 3GP, WMV, DivX, RealMedia (RM, RMVB), QuickTime MOV, DVD videos (VOB) and more. This software is simple and easy to use. 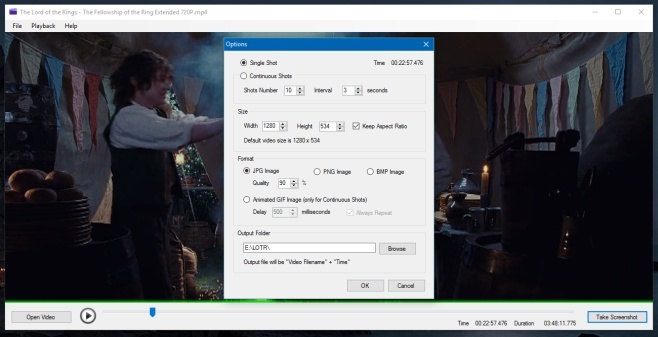 This video frame capture software provides hot-key operation, allows you to quickly and easily capture your favorite movie stills to static images or animated GIF images, you can use these screenshots as your computer wallpapers or share movie stills with your friends and so on.